It’s Cinco de Mayo! My husband and I went out yesterday to our favorite Mexican restaurant and enjoyed some delicious food and live Mariachi band in honor of the holiday. That left me in the mood to celebrate further–and what better way to celebrate than with a decadent dessert in cupcake form? Tres Leches cake is popular for its dense, milk soaked cake and light, whipped icing. The recipes vary far and wide, some including alcohol, some with variations on the type of milk used. I liked this one because it kicked it up with a kick of coconut and pecans. They might just leave you wishing to celebrate seis-siete-and-ocho de Mayo! Heat oven to 350°F. Place paper baking cup in each of 24 regular-size muffin cups. In medium bowl, mix flour, baking powder and salt; set aside. In large bowl, beat shortening with electric mixer on medium speed 30 seconds. Gradually add sugar, about 1/3 cup at a time, beating well after each addition and scraping bowl occasionally. Beat 2 minutes longer. Add egg whites, one at a time, beating well after each addition. Beat in rum extract. On low speed, alternately add flour mixture, about 1/3 of mixture at a time, and milk, about 1/2 at a time, beating just until blended. Stir in pecans. Divide batter evenly among muffin cups, filling each about 2/3 full. Bake 18 to 20 minutes or until toothpick inserted in center of cupcake comes out clean. Cool 5 minutes; remove from pans to cooling racks. Cool 10 minutes longer. Poke tops of cupcakes with holes with a bamboo skewer or long-tined fork, wiping occasionally to reduce sticking. Make sure to poke almost to the bottom of the cupcake and not to go through the paper cup. In small bowl, stir condensed milk, sweetened condensed milk, and coconut milk with whisk until smooth. Slowly spoon 2 teaspoons milk mixture evenly over top of each cupcake, allowing mixture to soak into holes. Repeat 2 or 3 times. Cover and refrigerate about an hour to let the milk mixture on tops of cupcakes absorb. In preparation, it’s best to freeze a metal bowl and even the beaters for your mixer in advance to help speed the process of whipping. In a large bowl, whip cream until stiff peaks are just about to form. Beat in vanilla and rum extracts, and sugar until peaks form. Make sure not to over-beat, cream will then become lumpy and butter-like. Refrigerate if you don’t need to use the cream immediately. When ready to top the cupcakes, spoon the whipped cream into a ziploc bag and cut the corner to your liking. Pipe on top of each cupcake. 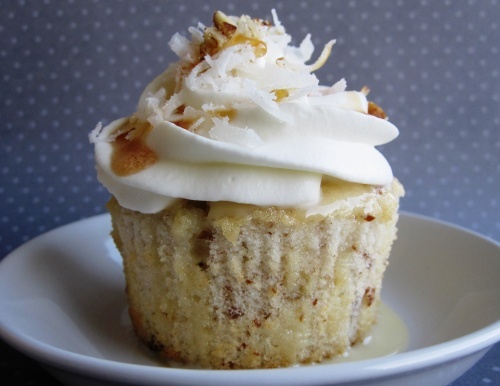 If you want, garnish with a caramel drizzle, more diced nuts, and toasted coconut. They look awesome….and like a lot of work!